New Year's Resolutions' time is up! 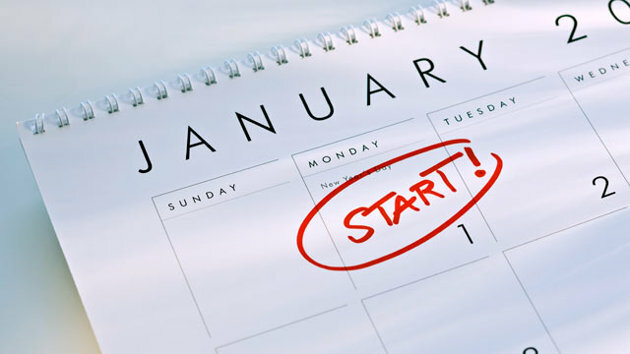 Have you started thinking of your goal for the new year? You still have several hours to decide on it. Writing your ideas down is good, too. Our Wellness Director, Brandon Holt (see his healthy holidays tips HERE), has a quote by Lee Iacocca at his desk, "The discipline of writing something down is the first step toward making it happen." I love it! If I did not write things down, I would not remember anything. Do you remember your resolution from the last New Year's? If yes, good! Have you followed your goal up to this day? Maybe less "yes" answers here. Well, you are not alone. Whether it is weight loss, quitting smoking, going to the gym, or picking up a new language, no goal is too easy to stick to. However, the studies (and other people's experiences) have confirmed that it is possible to increase your chances for success dramatically. Apparently, people are much more likely to stick to their goals if there are stakes involved. Moreover, it is the fear to lose rather than desire to gain that motivates us like nothing else. For example, losing $100 is more painful than receiving the same amount, in case you follow through with your goal. Why don't we use technology to our advantage? There is an online "commitment store" called stickK that uses the two most important principles of achieving any goal - creating incentives and assigning accountability. If you do not fulfill your commitment, the site tells all your friends about it! Moreover, you can put your money at stake, and every time you fail, the site will be making an automatic donation to a charity (or, more effectively, to an anti-charity) of your choice. Feeling uncomfortable putting your money at risk? You won't have to pay a dime if you stick to your goal. According to Tim Ferriss and his book "The 4-Hour Chef", based on stickK's goal completion percentages from 2008-2011, the success rate with no stakes is 33.5%. Once we add stakes like an anti-charity, that success rate more than doubles to 72.8%! Of course, you do not have to include any stakes. Last year, my Mom and I had a little competition right before the New Year (who would lose more weight during one month). We used stickK website and were each other's accountability partners. We did not put any anti-charity donations at stake (of which I regretted later), and... my Mom won because she had gained less weight than me. I gave her the prize, $100, but it was not painful, since it was my Mom, and I simply thought of it as a New Year's gift. I definitely want to include the anti-charity donation into my goal this year! If you are familiar with the Pinterest, you have probably spent hours and hours browsing through the pretty pictures. Unfortunately, not all the things on Pinterest are as great as they seem to be, but sometimes you can find a really useful piece of advice there. 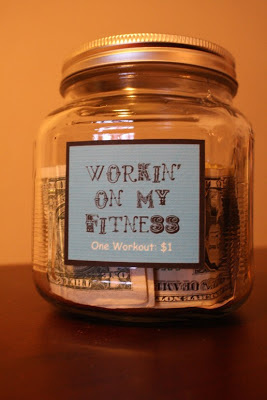 I have found a great one there recently - a workout tip jar idea. 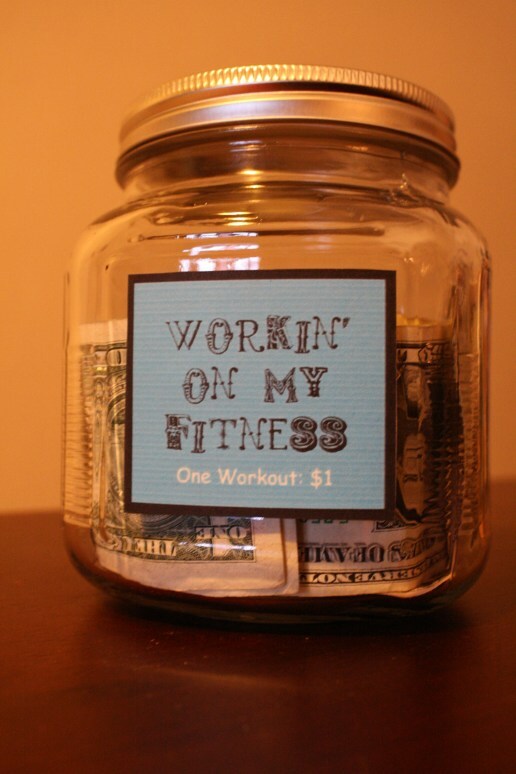 After each workout, you tip yourself $1. After a set number of workouts (for example, a hundred), you can treat yourself to new clothes or shoes (or a SPA visit), as long as it is NOT food (do not reward yourself with food, you are not a dog). It really motivates me to work out when I do not feel like it because I can earn another dollar towards my reward. New Year is a wonderful time when you can start your life anew. You get another chance to make a change to the better. I hope you are in great spirits and feel inspired to live the life you've always wanted. May all your dreams come true this New Year! It's beginning to look a lot like Christmas... Actually, it began to look a lot like Christmas even before Halloween, with all the stores having holiday items on their shelves. But it is much more so now, when you are running around, doing your last-minute Christmas shopping, and enjoying goodies from the gift baskets at work. I am definitely looking forward to all the wonderful sweets and foods in Germany where I will spend Christmas this year with my family, but I am a little anxious about damaging my health with loads of sugar. Our Wellness Director, Brandon Holt, shared his advice with us at work, and I am, in turn, sharing it with you. Hope you will find something that will help you stay healthy this holiday season! My comments are in italics. 1. Be realistic: don’t try to lose pounds during the holidays. Instead, try to maintain your current weight. - Oh, boy, this will be hard! 2. Plan time for exercise. Exercise helps relieve holiday stress and prevent weight gain. A moderate and daily increase in exercise can help partially offset increased holiday eating. Try 10- or 15-minute brisk walks twice a day. - We are planning to do a ton of walking to see the German castles. Check. 3. Don’t skip meals. 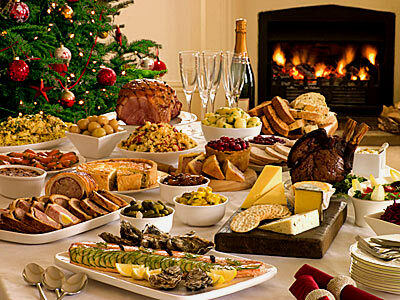 Before leaving for a party, eat a light snack, such as raw vegetables or a piece of fruit to curb your appetite. You will be less tempted to over-indulge. - I love baby carrots, even though my Mom doesn't... I hope she will get some for me. 4. Survey party buffets before filling your plate. Choose your favorite foods and skip your least favorite. Include vegetables and fruits to keep your plate balanced. - I always get protein and a ton of salad for my main meal and save my carbs allowance for dessert. 5. Eat until you are satisfied, not stuffed. Savor your favorite holiday treats, while eating small portions. Sit down, get comfortable, and enjoy. - Try to keep a lively conversation with your family and friends. That way, it will take you longer to eat, and you will actually have time to feel satisfied before it is too late. 7. If you overeat at one meal, go light on the next. It takes 500 calories per day (or 3,500 calories per week) above your normal/maintenance consumption to gain one pound. It is impossible to gain weight from one piece of pie! - Great to hear!!! 8. Take the focus off food. Turn candy and cookie making time into non-edible projects, like making wreaths, dough art decorations, or a gingerbread house. Plan group activities with family and friends that aren't all about food. Try serving a holiday meal to the community, playing games, or going on a walking tour of decorated homes. 9. Bring your own healthy dish to a holiday gathering. This will give you at least one healthy option. - For pot lucks, I usually bring a green salad... and cookies. Does that count as a healthy dish? - Gravy — Refrigerate the gravy to harden fat. Skim the fat off. This will save a whopping 56 gm of fat per cup. - Turkey – Enjoy delicious, roasted turkey breast without the skin and save 11 grams of saturated fat per 3 oz serving. - Don’t eat things that you simply don’t love… a lot of calories are wasted on Aunt B’s green bean casserole that you only eat because you don’t want to hurt anyone’s feelings. Save the calories for the good stuff only. - Desserts — Make a crust-less pumpkin pie. Substitute two egg whites for each whole egg in baked recipes. Replace heavy cream with evaporated skim milk in cheesecakes and cream pies. Top cakes with fresh fruit, fruit sauce, or a sprinkle of powdered sugar instead of fattening frosting. I definitely feel motivated to make conscious food choices this Christmas. Have a wonderful, healthy, and tasty holiday season!